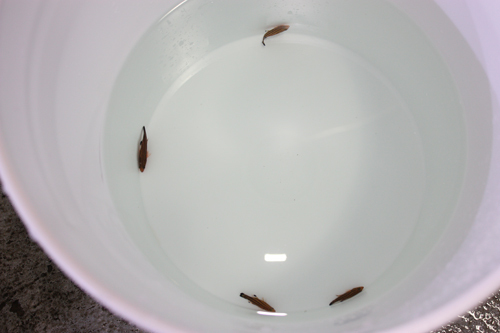 Home / Aquaculture / First captive-bred Liopropoma hit the trade! 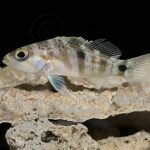 The swissguard bass, Liopropoma rubre, can now be added to the list of captive-bred fish species that have been offered for sale in the marine aquarium trade. Now, before you start looking for a sharp drop in price or for regular appearances on weekly availability lists, let me just clarify that only four of them have made it into the trade so far. 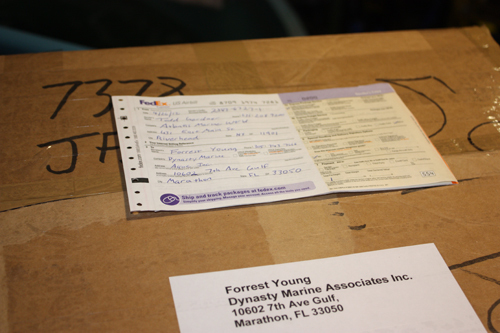 A few weeks ago, when I was satisfied that the four swiss guards I had in my growout system at the Long Island Aquarium had attained market size, I boxed them up and shipped them to Forrest Young of Dynasty Marine Associates to distribute to his customers. 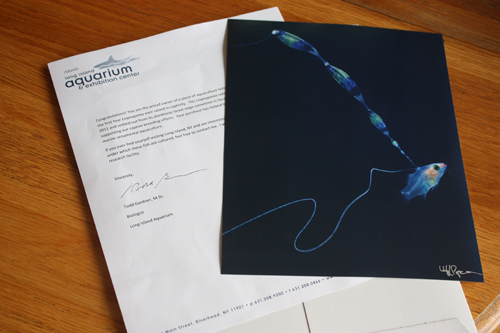 The original plan was to get prints of my favorite larval photos, signed by photographer, Christopher Paparo, along with a letter, from me, thanking each prospective buyer for supporting aquaculture research and congratulating them on owning a piece of aquaculture history. 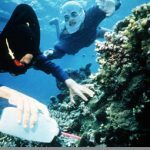 Then I was going to post an announcement here on Reefs.com to help promote the sale, hopefully helping Forrest get top dollar for these fish. However, when it came time to send the fish, the prints hadn’t yet arrived. “No problem”, I thought. It would take at least a week or two to get the swiss guards to their final destinations, so I had some time. What my plan didn’t take into account was our son, Finn, deciding to bail on uterine life two weeks ahead of schedule. So he was born right around the time the prints were arriving at the aquarium and I wouldn’t see them for another week. Needless to say, my plan was placed on the back burner for a while. When I returned to work the following week, I contacted Forrest to inquire about the fate of the swiss guards so I would know where to send the prints and the letters. Apparently, Forrest had also been sidetracked, as he had just returned from his honeymoon. 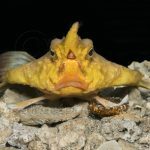 He told me all the fish had been sold already – two went to Japan, one, he thought, went to Liveaquaria, and he wasn’t sure about the fourth one, although I did hear an unsubstantiated report that it went to the legendary House of Fins in Greenwich, CT. So this week will be devoted to tracking down the new owners of these now famous basslets and getting these photos and letters off to them – even if it’s too late for me to help boost the price. Oh well, it was a good plan. Signed print of my favorite larval image. Now I just need to figure out where to send it. Todd, thanks for everything you have done to advance the hobby and captive breed fish. Its awesome. Okay, well, I tracked one down for sure. 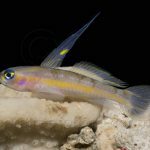 It didn’t go to House of Fins, but to Unique Corals in Los Alngeles. 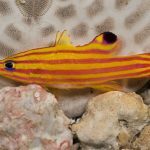 Joe Caparatta and Scott Fellman are regrouping in LA with a 5000-square-foot, 14,000-gallon facility devoted to marine fishes and corals, and one of my swiss guards is there to help them with their grand opening! I’ve seen what Joe did in a much smaller space in Manhattan, so I can’t wait to see Unique Corals up and running.